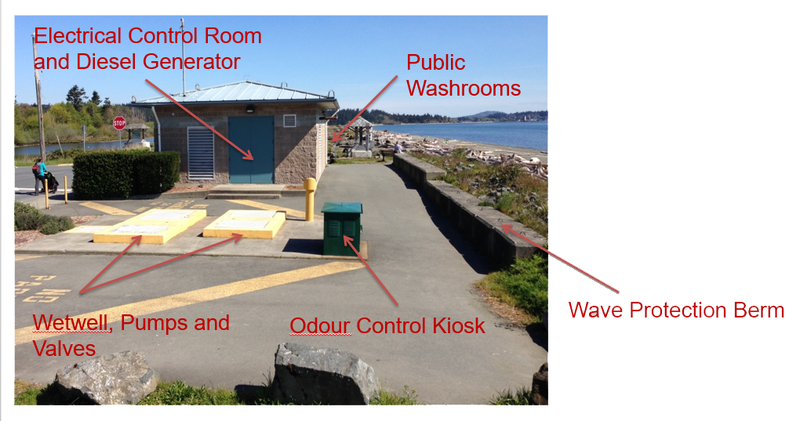 The City of Colwood has been actively monitoring sea levels and the effects of winter storm surges on the city's coastline since 2005. The most recent study by Northwest Hydraulic Consultants Ltd (NHC) revealed little change in the shoreline position (sea level) between 2005 and 2017, however it confirmed that the upper beach berm has been eroding more quickly. In the past, gravel mining operations at Royal Bay provided sediment that drifted along the shoreline and rebuilt the berm. Since the close of the gravel pit, the beach has not been able to rebuild as quickly from year to year. With sea levels expected to rise by the year 2100, the NHC study predicts the upper berm to retreat by nine to twelve metres, which would have a significant impact on existing infrastructure, including the road and the Ocean Boulevard pump station. NHC recommends 'nourishing' the beach, by depositing additional sand on the beach in a 200 metre area in front of the pump station. Sand would be brought in on a barge and deposited onto the beach using a conveyor. 1. Beach nourishment would provide a buffer against waves impacting the Ocean Boulevard pump station. The pump station is a critical piece of infrastructure that provides sanitary sewer service for homes in the surrounding neighbourhood. The City is exploring options and grant opportunities to relocate the pump station, because its current location is problematic from both environmental and risk management perspectives. 2. 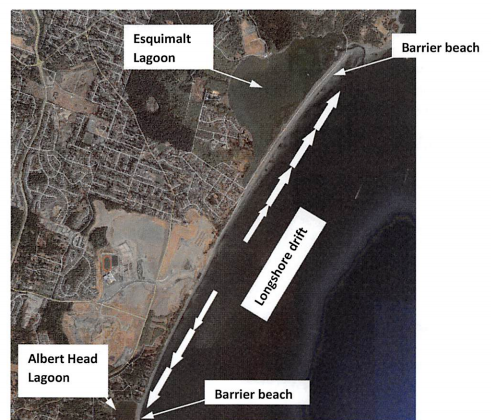 Beach nourishment would also provide drift material to replenish the beach area north of the pump station. These beach nourishments would mitigate the effects of erosion and sea level rise for an estimated 10 years, at a cost of approximately $600,000 over several years. The NHC study presented two other options for erosion mitigation. The first is a buried revetment, which is rock armouring that would begin at the edge of the parking area and extend below the beach to encourage the development of a new dune. This option would be expected to limit erosion for an estimated 30 to 60 years, but at a much higher cost of approximately $4.5M. The rock walls would also reduce public access to the beach. The other option is detached breakwaters, or a series of small 'islands' just off shore. This option would also be expected to limit erosion for an estimated 30 to 60 years, at an even higher cost of approximately $14M. It would significantly change the shape of the beach and views from the shoreline. Read more about the NHC report. The most immediate risk to shoreline infrastructure and to the health of the beach is the Ocean Boulevard pump station, which is vulnerable to flooding due to wind, waves, sea level rise and tsunami risk. The pump station provides sanitary sewer service for homes in the surrounding neighbourhood and failure would have a unacceptable environmental and service impact. A 2016 study by the consultant team of Kerr, Wood, Leidal (KWL) resulted in the raising of the lock block wall in front of the pump station to protect it from wave run-up in the short term. KWL recommends safely relocating the pump station to the southern edge of Pit House Park at the end of Goldfinch Road. This location is based on flood construction level data presented by KWL in their report. The estimated cost for the relocation is $2.5M, and the City's five year financial plan includes a budget placeholder for that amount. Staff have applied for potential grant funding via the Investing in Canada Infrastructure Grant - Green Infrastructure Stream which would provide funding up to 73.33% of the project costs. Read more about the KWL report. These options were presented at Committee of the Whole on September 4, 2018. Regarding coastline erosion, the committee made a recommendation that "Council direct staff to bring forward a line item for 200m of beach nourishment...during the 2019 Capital Budget process." On the issue of relocating the pump station, the committee recommended that "Council direct staff to have KWL further refine relocation to Pit House Park...to enable this option to be put out for tender in 2019 for construction in 2020..." The committee also recommended that Council direct staff to provide a report confirming the status of protective covenants understood to be in place at the City-owned property known as Pit House Park. These decisions are expected to come to Council at their next regular meeting on September 24, 2018.